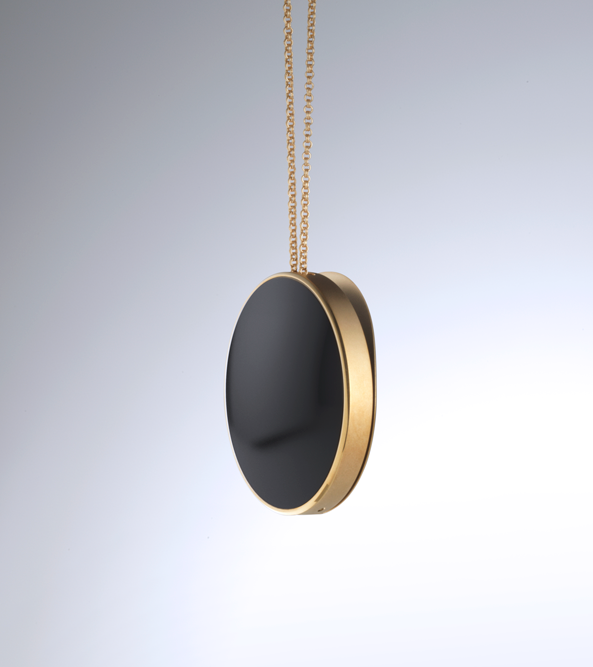 A locket for the 21st century. Wearable tech has come a long way since the days of Steve Mann’s contraptions. Devices are getting smaller, smarter, and faster than ever before. Yet makers of these devices still aim for the low-hanging fruit by simply shrinking our phones or telling us things we already know—we should move more, our inboxes are full, our lives hectic, on and on. And then there’s the style. Projected to become a $30 billion to $50 billion industry, the promise of wearables has made the fashion industry start paying attention, but the majority of devices are still feature and technology driven. To make up for this, fashion trends are grafted on gadgets, making them trendier, but leaving their value proposition just as murky. Beauty and meaning remain an afterthought. Elegant and simple, Purple is a modern take on the locket. It connects wirelessly to your social networks and receives images and messages from friends and family. Purple invites you to take a peek at what’s inside, pause from your hectic daily life and smile at a moment you share with the people who matter most. Purple was created via Artefact. Purple is jewelry first, technology second. From the curved lid of the locket to the unique chain hook, Purple is designed to be an heirloom piece of jewelry. Timeless materials like platinum, silver, gold and even brushed brass, together with pure smooth lines make it stand out in the sea of wearable gadgets. Jewelry doesn't have USB ports to plug into the wall and neither does Purple. 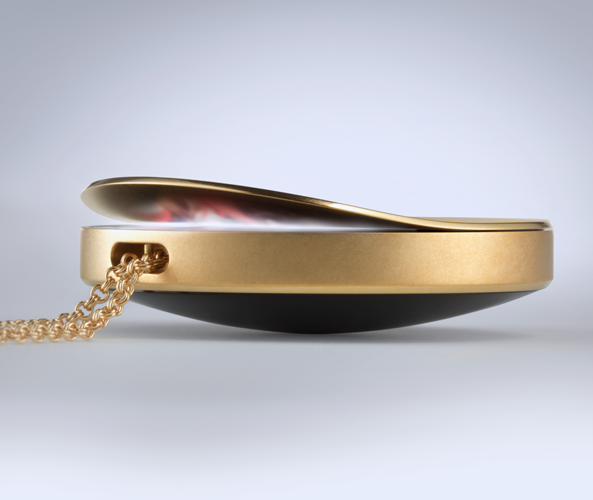 To charge the locket, simply leave it in its ceramic charging bowl. It's as effortless as leaving it in a jewelry box. Purple's smooth black or frosted glass back is the key to its inductive charging capabilities, yet it enhances, rather than distracts from the beauty of Purple. 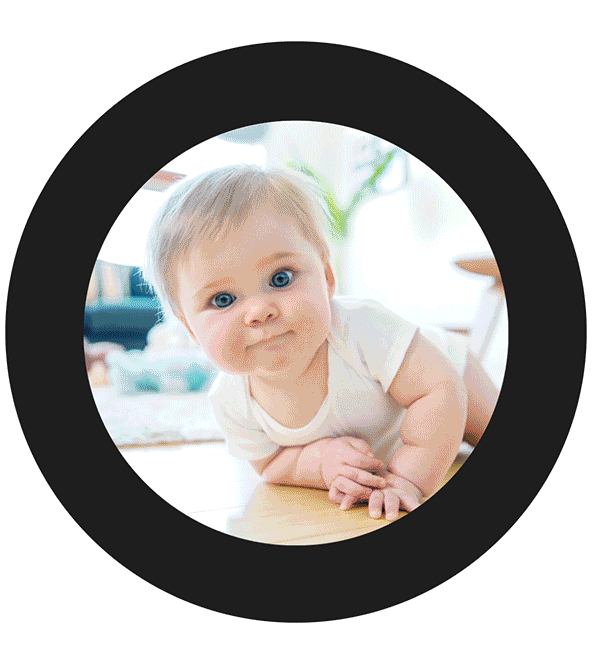 Browse keepsakes, saving them or sending a response - all actions on Purple are a single gesture away. 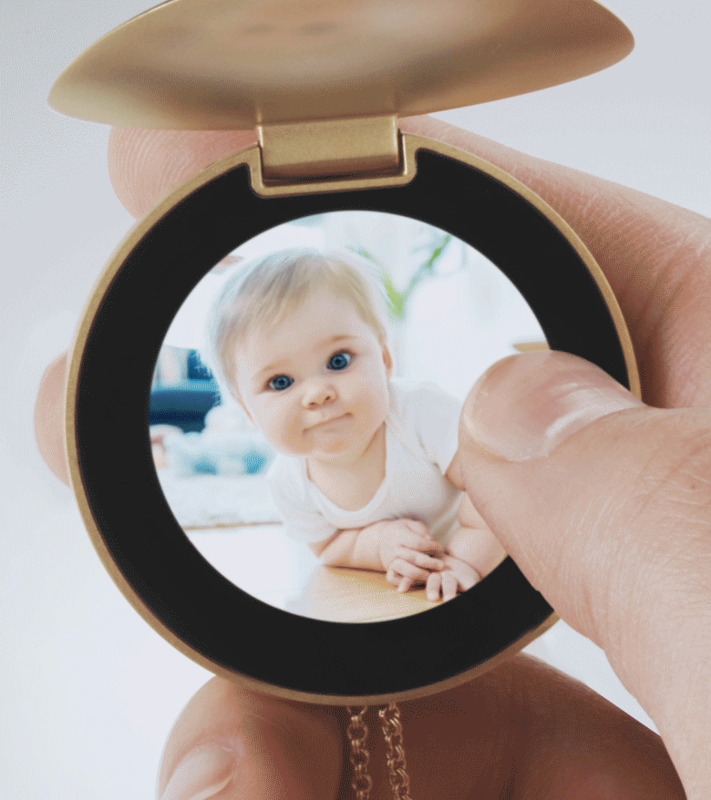 Each of the gestures - from peeking into the locket, to cradling it in your palm - is designed to remind you that this is a meaningful moment to cherish. To pause, peek, and smile. Purple is a proof of concept prototype, featuring a lithium polymer cell battery, Silicon Labs processor, BLE support, inductive wireless charging, and enough storage to hold as many keepsakes as you can possibly imagine. Purple's companion mobile app is the command center of the experience, where you can see who you're connected with, what you share and how you share it. The app houses a library of your keepsakes and lets you customize the entire experience. From adding filters and animations to photos to selecting and arranging which ones you see on your locket, the app lets you soak up your favorite moments all over again.